Would you risk your life for the right to vote? It’s not until you speak to people who have risked their lives for the right to vote that you realize how lucky you are just to have that right. A coup le of weeks ago, I listened to a man who had spent seven years in jail in Burma (Myanmar) for participating in the student demonstrations for democracy in 1988. Hundreds, or maybe thousands where shot by the army. Nobody really knows the true death toll. During Naing Ko Ko’s time in prison, he was put into the ‘dog cells’, where prisoners were beaten every night around 3 a.m. After being released and leaving the country, he got a scholarship to study in New Zealand, where he currently lives. 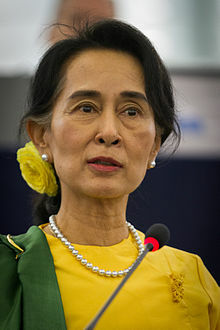 The leader of the pro-democracy movement, Aung San Suu Kyi, ended up under house arrest for 20 years. In Burma, GDP person is about fifty percent higher than in Cambodia (the poorest country I’ve ever been to) but the current government spends about thirty percent of the country’s GDP on the military, even though the country has no external enemies. Just based on the arithmetic, the standard of living must therefore be about the same as in Cambodia. Children aged ten are being forced into the army. It’s not a happy situation. New elections are scheduled for November 8. Already the regime is putting obstacles in the way of voting. A couple of local Burmese students in Australia who want to vote told me must do so in person at the Burmese Embassy in Canberra. For a student in Perth, this would be like travelling from San Diego to Washington DC. The Army will still have a guaranteed minimum of 25 percent of the seats in the parliament. The generals call this “disciplined democracy.” The expression makes me shudder. Voting rolls have been published, and there are lots of dead people on them. I hope their election doesn’t turn into a shooting match. If it does, I’ll post something about any aid organisations that might be worth donating to. In the meantime, when people I know complain it’s not worth voting, I can only say that the right to vote is a valuable thing. No matter how much you may dislike your own county’s parties or politicians, most of the people reading don’t have to risk their lives to go to a polling booth. We are lucky. Let’s remember that. Read about Aung San Suu Kyi here , GDP per person (living standards) here some articles by Naing here, and the 1988 elections here and finally, a BBC background article here. Previous PostDid Australia really ban all guns?Next PostPolarized thinking, victimhood, and the problems of rational debate.